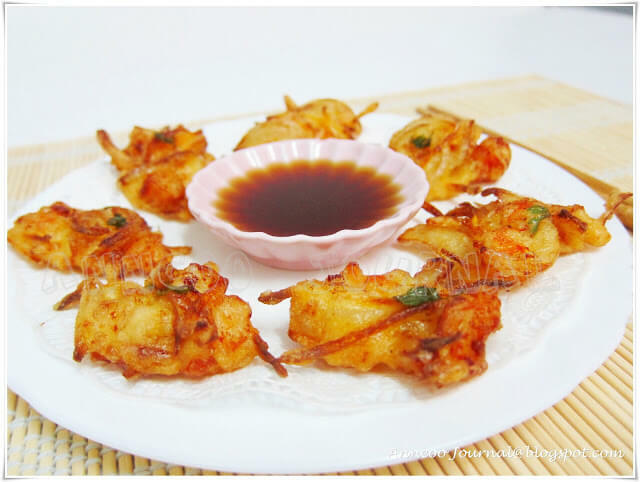 I love to make Prawn Fritters with Veggie at home especially serve as Japanese set meal. It is not oily with only salt and pepper as seasoning. You can also serve this as finger food for children’s party too. Remove shell and vein from prawns then cut to cubes not too small. Season with some pepper and salt. Combine the batter ingredients together in a measuring cup and blend into a smooth texture paste. Add enough oil (I used canola oil) for shallow frying with two drops of sesame oil in wok. In a medium bowl add some prawn cubes, grated carrot and shredded together. Then add about 2-3 tbsp of batter (not too thick) into the prawn mixture with some coriander leaves or spring onion. Drop the coated prawn mixture in small portion into hot oil gently with a fork and spoon and shallow fry till golden brown. Dish up and drain oil well. Serve Prawn Fritters with dipping sauce (here) or Mayo sauce mix with some mustard into it. I cooked this when I saw your entry back in Oct but only had time to update my blog recently. Thanks for sharing this recipe, my kids have enjoyed themselves. Chris & Hearty Bakes ~ So glad that both of you liked this dish. Sharon ~ Try it out, is really easy and yummy. Hi Ann, dropping by to share with you that i prepared this for dinner. It was really nice! I like mine dipped with chillies. My children love it too. What a great way to get them to eat greens. Thanks for sharing Ann! Paula, Xiaolu ~ This is very easy to prepare, try it at home and you'll love it! I did this yesterday – very nice. I bet these were gone in a minute! They look tasty! drool all over the keyboard! Mmm shrimp/prawns are my favorite form of protein. These fritters look mouthwatering. it looks sooo stylish! I love it! Thank you everyone for leaving your lovely comments. Tigerfish ~ Yes you can use 1 cup of plain flour alone if you like. Actually this is not that cripsy but you still can feel some crunch in it. Thank you Rebecca. Sure to look around. Biren ~ hehee…my boys finishes this in no time. Ai Ping ~ hihii why don't you make the prawns into paste? Tata ~ Is green bird chillies like chilli padi? Heavenly Housewife ~ Thank you. What a delicious treat to snack on. I bet these are amazing when fresh, hot and crispy! I bet nobody would say no to prawn fritters.. This looks good! My elder boy doesn't like prawn, maybe I can try this way and see if he eats them? But can I shredded the prawn too so that he won't see the whole prawn there? Will that be able to make up the 'cube'? Ya'll have the most wonderful day filled with warm fuzzy blessings!!! Very nice Ann…simple and delicious! The kids will love this! Will have to make a huge batch for parties as they make great finger food. Hey, Ann, this is very addictive! Can't just stop attacking them! I can only imagine the delicious savory crispiness of these lovelies 🙂 …so we can't do this well with just one type of flour? We need to combine? Yum! These are so delicious looking. Like to eat this, I think I can finish up the whole plate! No problem Faithy! Sometime I use deep fryer for deep frying. Lia ~ hahaa…you still remember about that party! Of course can serve with any sauce you like. Sonia ~ I think this more Japanese style and it is a great idea adding bean sprout and chives in it. BeeBee ~ Thanks, this is really good with the dipping sauce. Chris ~ can use 1 cup of plain flour if you don't have rice flour. Hi Ju ~ Thank you! If you want to make a lot of this, you need another extra hands to help you. HK Choo ~ Yes adding a little of sesame oil is a Japanese way of doing it and it is very fragrant snack too. Lyndsey ~ Please make them for your family. They will love it. Min ~ It is OK to make this at a small portion at home. Busygran ~ hahaa…most Singaporean loves to eat with chilli sauce but I like to go with dipping sauce because there no seasoning in it except little salt and pepper. Oh dear dear Ann, "prawns" say no more. You sure are after my heart with this recipe ;-). I LOVE prawns. When you wrote 100g prawns, I read 100 prawns, and I thought, "wow, she loves prawns as much as I do." lol. Although I don't think I'd have any problems with 100 prawns if theyre made this delicious either :-P. This is such a wonderful, simple recipe. Thank you for sharing, Ann. looks so tempting, this is great finger food! Tempting finger food! I would eat with thai chilli sauce! Looks so yummy! I usually will buy this from hawker stores because I find it troublesome to make it my own. Yummy yummy. very nice presentation and nice photo. Ann these look wonderful! I don't even care for prawns, but I would enjoy these! I should make them for my family! I say pretty awesome for an adult party, too. Ann, this is one of my fave snack foods! Such a lovely dish you made … golden brown and crisp! Wow, I'm salivating! Please hand me some chili sauce. Yummm…. Thanks! Looking forward to make this soon. Have a nice day! Is it dinner time is near or are these prawn fritters looking so good! Mmmm…can imagine the crispy-crunch outside and the juicy sweet prawn inside… Yummy yum!